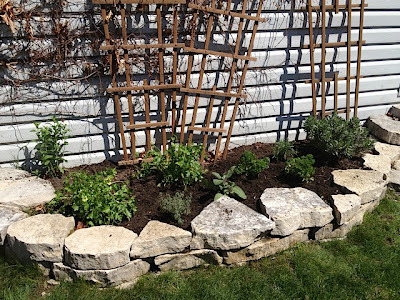 Your first Paleo garden can be easy to plant and maintain and beautiful to look at. 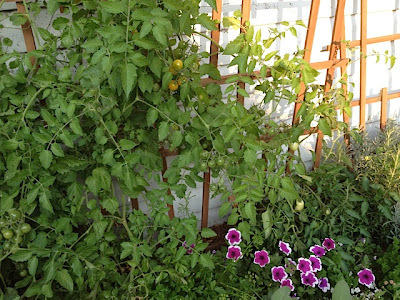 For all of you who are ready to commit to starting a vegetable garden, regardless of how large, I have been writing a series of posts on Square Foot Gardening which I believe is the best and easiest method of gardening. But I realize that there are also a lot of you who don't have the space for a garden or possibly even the desire to go in that direction. 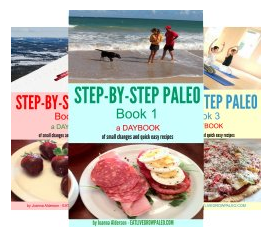 As I wrote in step 10 of Eat Paleo in 10 Easy Steps, the "icing on the cake" so to speak of Paleo eating is growing your own herbs, and in order to make it super easy as well as relative to the Primal Blueprint, I'm going to show you exactly how to do this step by step. This is for those of you who have never set foot in a garden centre and wouldn't know the difference between a rosemary bush and a basil bush. Anyone can grow this garden and here is exactly how to do it. First, the inspiration. 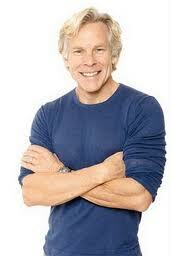 Mark Sisson wrote a post on the six common herbs that you should be eating, which you can read here. and I think this is the perfect base for your first Paleo garden. Read the post, find out why he thinks these are so important, and then, once he's convinced you, come back here and let me show you how to do it in 3 easy steps. Step 1 - Go buy what you need. This means you get to visit that garden centre. Get a trolley - you will need it. First pick up a large bag of organic growing mix. There are many varieties available and any will do as long as it says "organic" on it. Don't get just plain earth because you want a mix that already has fertilizer mixed in. Now choose a container. I suggest a long narrow one that you can bring inside once the weather gets colder so you can grow your herbs year round. 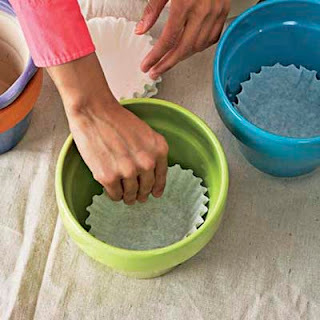 You need a pot with holes in the bottom and a saucer that goes under it to catch the excess water. You also need a pot that will fit 6 to 8 small plants comfortably. Figure on about 4 to 6 square inches of space for each plant, depending on how large you want them to grow. Alternatively you can buy small individual pots and saucers if these fit the space you have better. The ones above are made especially for a windowsill and share a saucer, but you can also get individual pots and saucers. 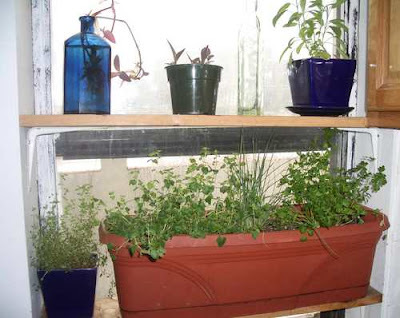 Some people have gotten very creative when it comes to containers for their herb gardens. If your space is very limited, the above idea might be for you. Just make sure you put a boot tray underneath for all the water that will drip! 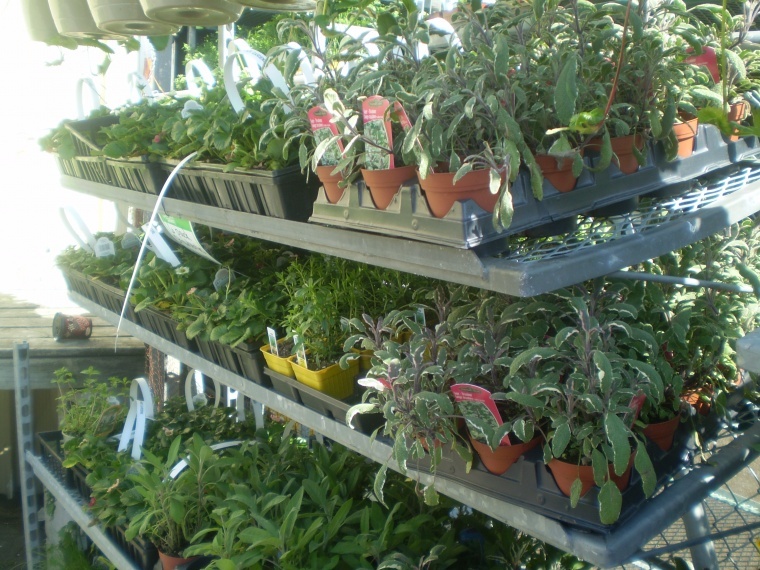 Lastly make your way to the herb section and pick out your plants. As you can see, all the plants have tags so even if you can't tell one from the other you won't have any problem choosing the ones you want. 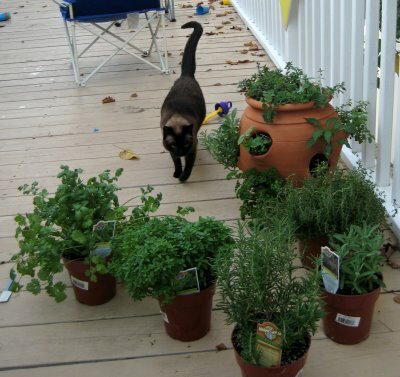 Mark suggests oregano, basil, mint, sage, thyme and rosemary. I would add to that list chives and parsley. These two herbs are ones that I find I use all the time in cooking and you probably will as well. Before you fill your container with the planting mix, here is a neat little trick. You know those holes in the bottom of the pot that are there for drainage? Get a couple of used dryer sheets (or pieces of old T-shirt will also work) and cover these before you put in your soil. Alternatively you can use coffee filters. 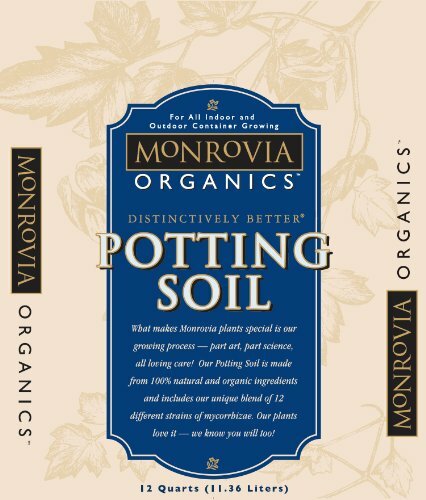 This will still allow drainage for your plants but will keep your soil from falling through the holes and making a mess every time you lift the pot. Now fill your pot with the soil mix about 3/4 full. Then using a large spoon (I'm assuming you don't have any gardening tools) make 6 holes evenly spaced in your pot. Make the holes about as deep and wide as the pots your plants came in. 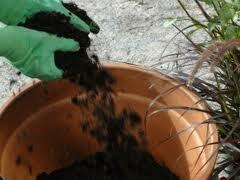 Remove the plants from the pots and place them in the soil. Press them down gently, then put a bit more soil mix around each plant so that when you're finished the pot is full of earth to about half an inch from the top. Another tip here. 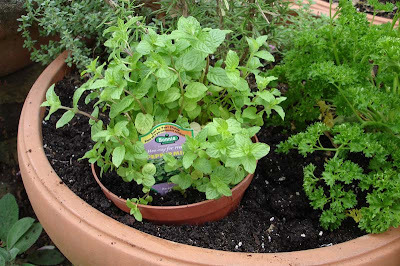 Mint is very invasive and will gradually spread and take over your pot. To stop this from happening, don't remove the mint plant from it's pot. Just plant it pot and all and then cover with more mix. Some of the roots will still make their way out of the holes in the bottom but this will keep it under control. 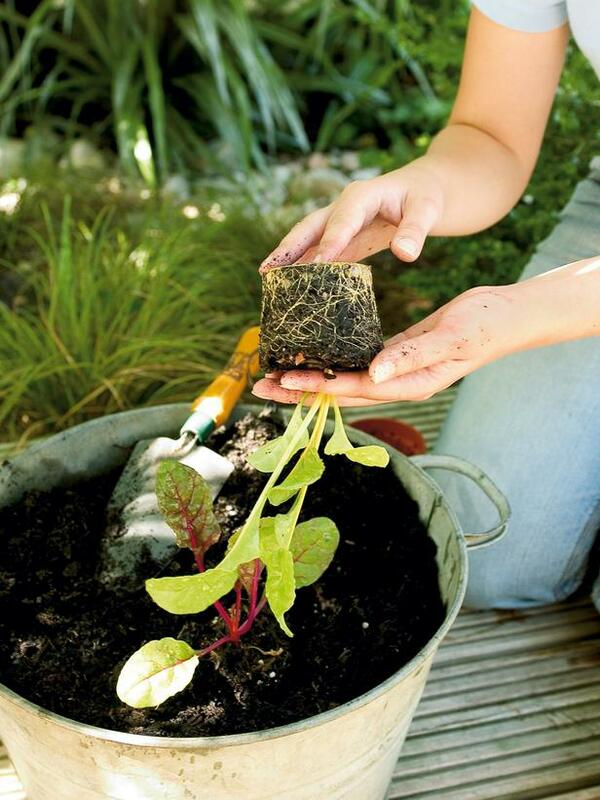 If you are planting in individual pots, put a couple of inches of planting mix into the bottom of each pot, put in your plant, then fill up the rest of the space with more mix. Now all you need to do is place your plant container in a sunny spot. If you have a patio or garden and it's warm outside, this is ideal. If the weather is still cold then find a sunny windowsill. If neither of these options are available to you you can put your plant pot under a standing lamp or on a kitchen counter under lights. I have florescent lights under some of my cabinets and I find this works very well as a grow light. 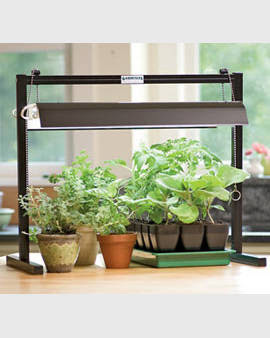 You can also buy a tabletop grow light that you can set up in your kitchen or in any room regardless of what light you have available. My son built me this small raised bed which is just big enough for all my herbs. 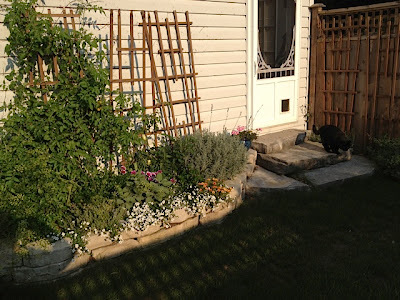 It gets lots of sun during the day (which is important) and is also right outside the back door (also important) for easy access when I'm cooking. I bought starter plants from the nursery and it took me 20 minutes to plant this bed. Spending 20 minutes in the warm sunshine so I can have a summer's worth of fresh herbs for my cooking sounds like a good return to me. 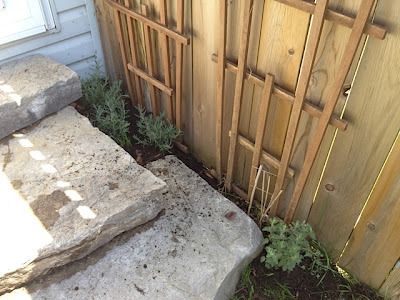 I even managed to squeeze in a few lavender plants beside the fence and a cat mint plant for my cat as well so she doesn't feel left out. This year I did what I recommended in my first vegetable garden post and just added a few tomato and salad plants in with the herbs. I also added a few trailing flowering plants to give the garden a bit more colour and I think it turned out quite well. 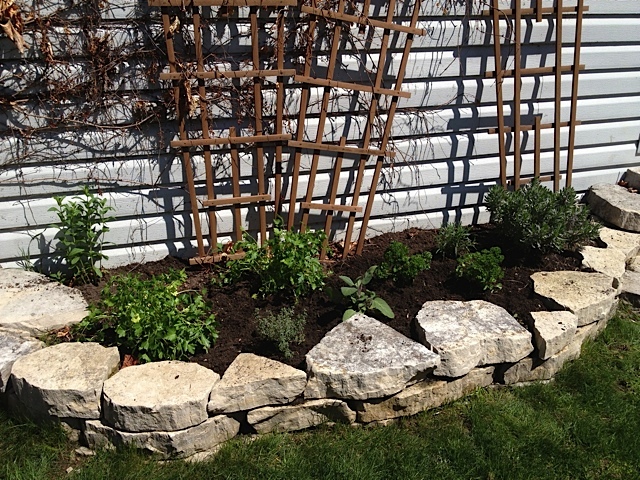 I mulched all the plants when I put them in, and I also planted them pretty close together. This way I never have to weed, and when I water it all soaks into the ground instead of evaporating in the hot sun. I also chose climbing cherry tomatoes. 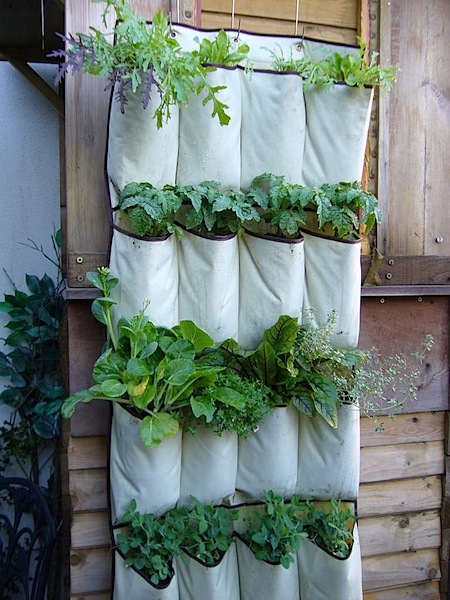 These are the easiest to grow - as long as you have some support - because they don't take up a lot of room. For everyday use, I think cherry tomatoes are the tastiest and the easiest to throw onto a salad. I know it's hard to believe looking at it now, but in the spring I did have room to grow some lettuce and spinach as well as a few radishes. 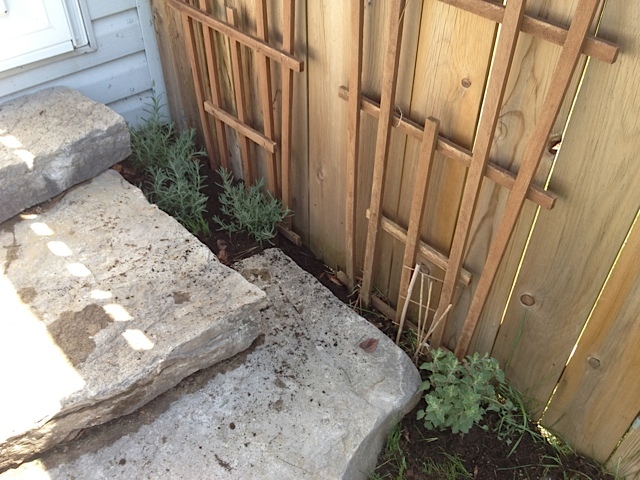 (You can see the spaces in the original planting I did above.) By the time the hot weather came and the herbs and tomatoes had taken over, I had already harvested a nice little crop. You notice my garden isn't perfect. 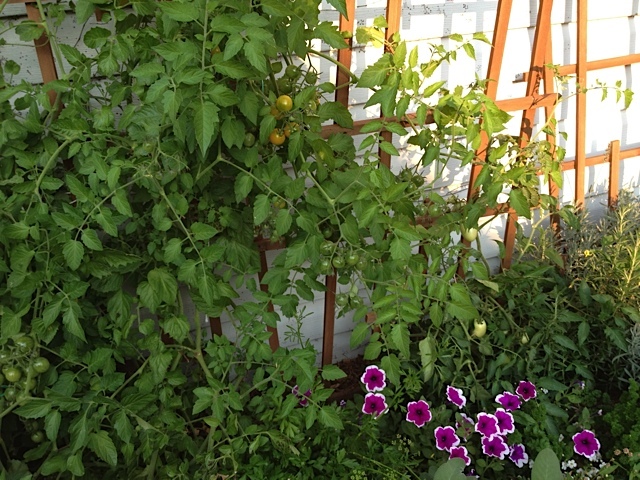 It won't win any prizes, but it looks nice and lush, and most importantly, it gives me lots of fresh herbs and tomatoes. That I think is all that matters. For those just starting out, this is a nice manageable size and you will be amazed at just how much you can grow in such a small space. 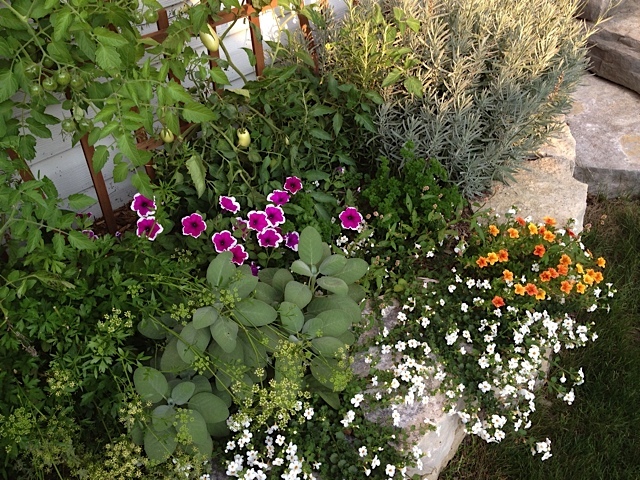 Whether you grow in a flower bed or in pots, growing your herbs doesn't require more than a few minutes of maintenance once a week. 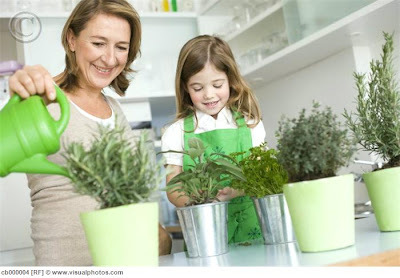 Once you have settled your plants in their new home, give them a good watering. Once you see the water starting to seep into the saucer, that's enough. Then all you need to do is check the earth a couple of times a week. If it's dry to the touch, take a spoon and dig a little hole and see if it's dry an inch down as well. If it is, then your plants need more water. 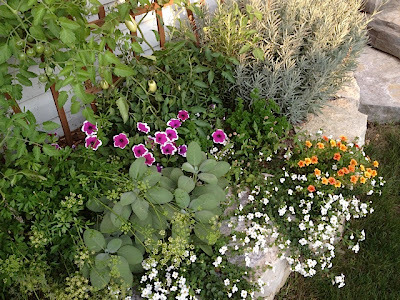 If you're growing your herbs in a flowerbed outside, watering once a week is usually sufficient unless it's extremely hot. If that's the case then check your plants at the end of the day and if they seem dry water them then. Watering during the day, especially when it's hot is not a good idea. The water usually doesn't get a chance to get down to the roots before the hot sun evaporates it all, so water once the sun goes down. So that's all there is to it. 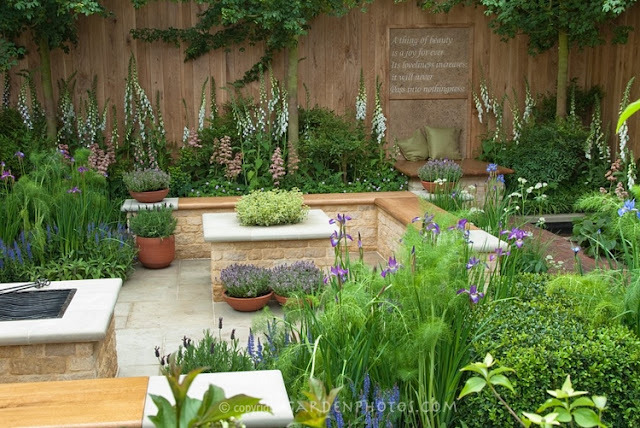 Now you have a herb garden with all the herbs Mark suggests you use available to you on a regular basis. Every time you cut some fresh herbs to use in your cooking you can congratulate yourself on growing some of your own food. And who knows .... you might be so proud of yourself that next year you'll be ready to progress to Gardening 201 and start growing some vegetables!